As the cold winter months loom large, the perennial issue of how to safeguard the thousands of homeless people in Brussels during one of the riskiest parts of the year is back on the agenda. Campaigners say the city’s annual ‘winter plan’ – which kicked in on 15 November with extra emergency beds and services – can only go some way to plastering over cracks in the system. 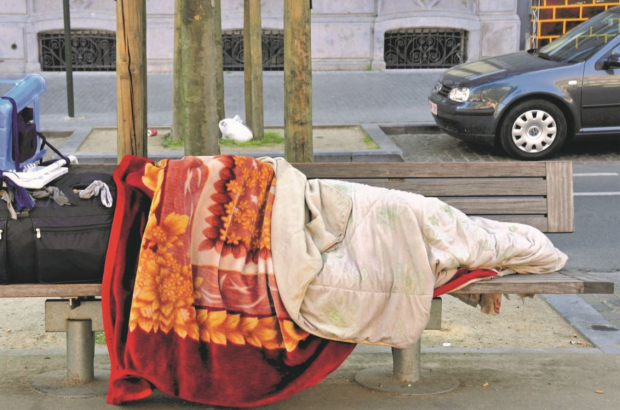 Homelessness in Brussels almost doubled between 2008 and 2016, says La Strada, which gathers data and raises awareness and was due to conduct its biennial census this November. While 3,386 people were logged during a census in November 2016, nearly 4,100 were counted in a one-off follow-up in March 2017 and the current number could be higher, according to director Yahyâ Samii. He says there are “not enough places in the official structures” and that around 60% of people were finding “unofficial solutions”. It’s an upward trend that is mirrored across Europe, with only a few exceptions like Finland, according to the European Federation of National Organisations Working with the Homeless. But in a city of 1.2 million people like Brussels, even this increased level of homelessness – which includes people in shelters, squats and train stations as well as street sleepers – could be dealt with more easily with the right resources and policies, says Samii. La Strada’s database of services lists 99 organisations serving the sector in Brussels alone. As things stand, a significant number of those – comprising government-subsidised organisations, NGOs and charities, voluntary and religious groups, and citizens’ initiatives – focus on shorter-term crisis management Organisations such as Samusocial, Pierre d’Angle and the Ariane centre provide around 500 emergency beds between them per night, year round. Some ‘transit’ places are also provided by CPAS, the social services centres run by individual communes. Oversubscribed homeless shelters have nearly 900 places, in which people can stay for several months, for a daily charge of €15 to €17. Day centres provide social and psychological services and a place to rest, while a host of organisations offer additional day-to-day help. These include DoucheFlux, which provides showers, Medecins du Monde for medical care, mobile mental health teams such as SMES-B, legal assistance from organisations like Droits Sans Toit, social restaurants like Resto du Cœur, and mobile laundry service Bulle. Under the city’s official winter plan, a further 600 beds are gradually added to the Samusocial tally between mid-November and the end of April. 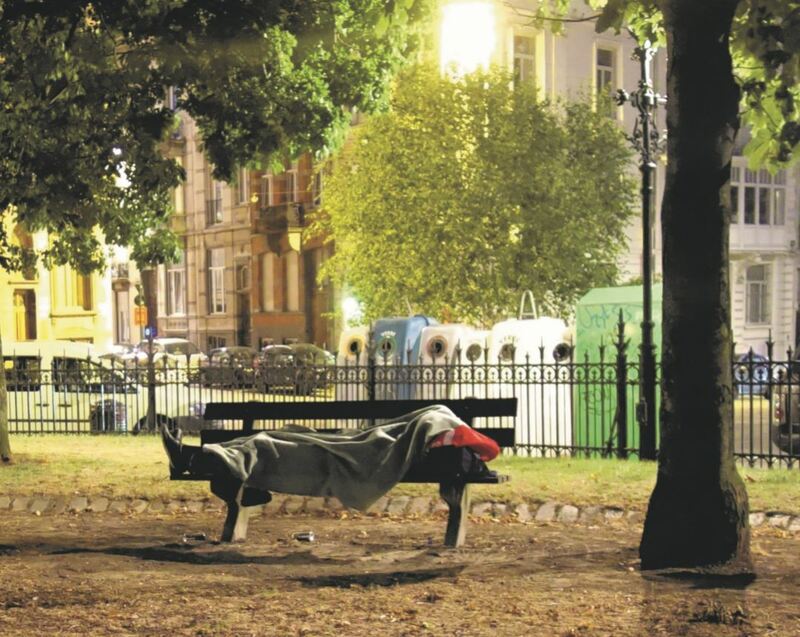 Last winter, the Citizens’ Refugee Support Platform also negotiated with the Brussels regional government for extra funding and the use of a building in Evere to shelter around 300 of the mostly undocumented migrants who had been living rough in Maximilian park, in the centre. In the adjacent Porte d’Ulysse building, the Platform runs a welcome centre that has now accrued up to 350 places. Further joint funding for the Platform, Samusocial and the Red Cross enabled the centres to reopen in June for homeless families and migrants, but uncertainty remains over what will happen this winter. The Platform also coordinates the hosting of around 200 migrants per night with volunteer families, and helps run collective houses, while around 100 people still sleep in the park. Individual initiatives can also pop up during the winter, such as the distribution of 100 cardboard tents last year by electric car entrepreneur Xavier Van der Stappen, who is fundraising to increase the stock for this winter. However, longer-term work to help people ‘exit’ homelessness through sustainable housing and social support has been prioritised in recent years, says Rocco Vitali, from the office of Brussels region minister Céline Fremault, who – alongside fellow minister Pascal Smet – is responsible for housing and homelessness. New developments include the Housing First project, a concept that reverses the idea that people have to fulfil certain conditions – such as being addiction-free – before they can secure a home. Homeless people, who are often severely socially excluded and suffering complex health problems, are instead intensively supported into first getting into their own home, then stabilising their situation. 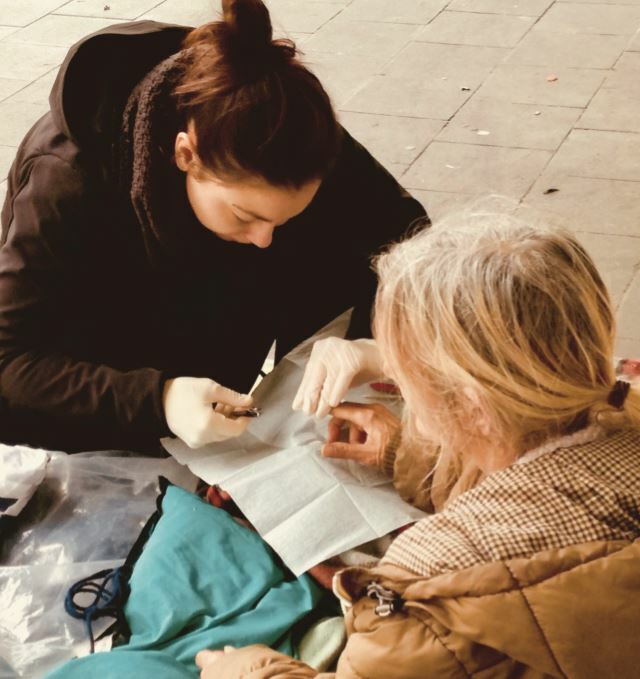 One Brussels organisation that works with Housing First is Infirmiers de Rue (IDR), a team of nurses and social workers who build relationships with longterm homeless people, aiming to reconnect them with society and get them permanently housed. Once stabilised, they’re matched with volunteer buddies to prevent them falling back into homelessness. They have resettled about 120 people over the last eight to 10 years, says IDR’s Koen Van den Broeck, who says homelessness can be eradicated. “It must be possible to end it in the mid- to-long term,” he says. “Somehow the idea has settled in people’s minds that to have homelessness in a city is normal.” He adds that with a third of their patients suffering from mental health issues, “somewhere in our mental health system there are holes through which people are falling into the street”. IDR was also involved in a recent survey of homeless people, completed over three days in September by the campaign 400 Toits, which aims to find stable housing for 400 of the city’s 500 to 700 street homeless people by 2020. Their face-to-face initiative involved volunteers completing 284 interviews with homeless people. Initial results showed that 58% had spent more than a year on the streets, 46% had been attacked while homeless, and 32% said they were unable to meet their basic needs. Homelessness anywhere involves a complex mix of social, economic and political issues. In Belgium, the inter-woven layers of federal, regional and municipal responsibilities, as well as those of the language communities, arguably add to the complexity. A case in point is the political battle over homeless migrants. When the Citizens’ Platform sought funding, they appealed to the Brussels-Capital regional government because the federal authorities, responsible for migration and asylum, refused to step in. “The migrants are not considered by the state as existing as part of the homeless population of the country,” said Platform coordinator Adriana Costa Santos. When the region granted money for the Porte d’Ulysse centre, they sent the bill to the federal government but it was “met by a tweet” from the Belgian asylum and migration minister, Theo Francken, saying: “zero euros”, said Vitali, who called it a “sad state of affairs”.